U.S. Rep. John R. Lewis, who represents Georgia’s 5th Congressional District, will be the speaker for the 174th Commencement exercises of Emory University’s Oxford College. The event is scheduled for Saturday, May 11, at 10 a.m. on the Oxford College Quad. Born the son of sharecroppers in Alabama, Lewis began a life of non-violent activism as a student at American Baptist College and as a participant in sit-in demonstrations at Nashville’s segregated lunch counters. In 1961 he volunteered to participate in the Freedom Rides throughout the South to test a decision of the Supreme Court from 1963 to 1966, where he endured several arrests and beatings. After years of work in support of voting rights and as leader of the federal volunteer agency ACTION during the administration of President Jimmy Carter, Lewis entered politics in 1981 as a member of the Atlanta City Council. He was elected to Congress in 1986. In the more than 30 years since then, his moral stature and dedication to protecting human rights and securing civil liberties have earned him widespread respect and admiration. This is Lewis’s second time to address Oxford College. He last appeared on the Oxford campus in March 2002, when he delivered the Mills Peace Lecture. 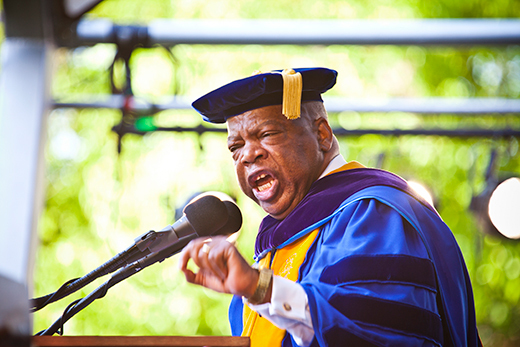 In addition, Lewis served as the Emory University Commencement speaker and received an honorary degree from the university in 2014. Emory University offers two starting points for first-year students: They may apply to Emory College of Arts and Sciences on the Atlanta campus or study for their first two years at Oxford College on Emory’s original campus in Oxford, Georgia. After the sophomore year, all students choose to complete their undergraduate degree on the Atlanta campus through Emory College, the Goizueta Business School or the Nell Hodgson Woodruff School of Nursing.